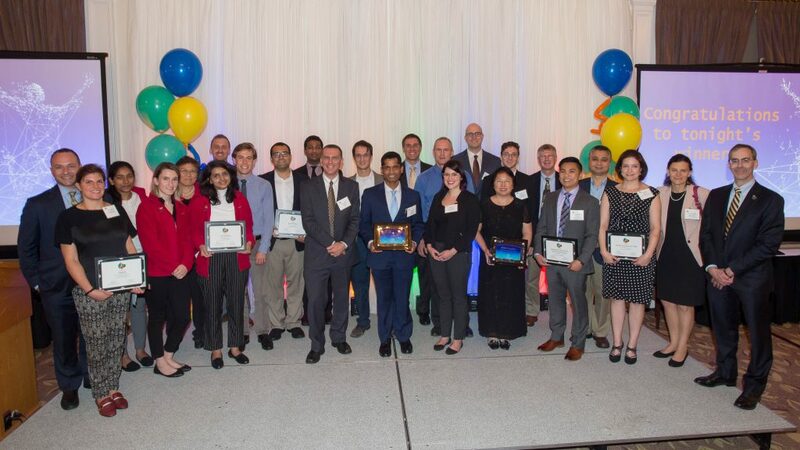 Winners of awards in the 2018 Pitt Innovation Challenge (PInCh) at the University Center ballroom. 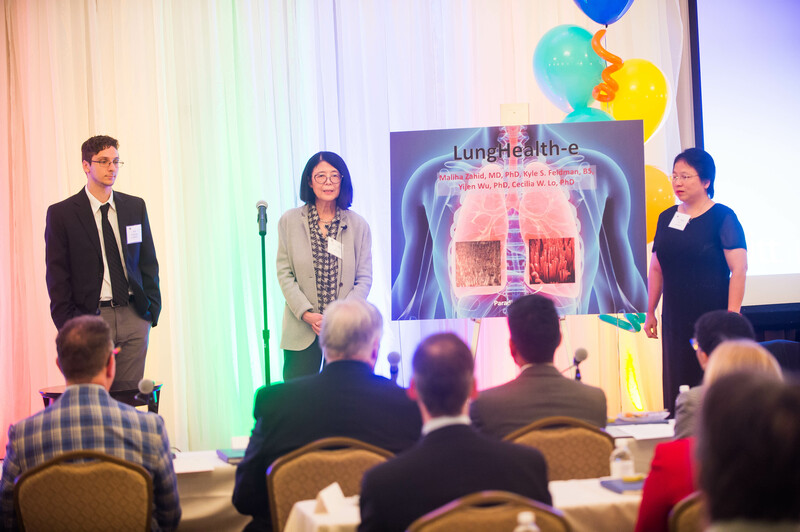 A breathylizer to detect cancer, a new treatment that addresses the cause, not the symptoms, of chronic obstructive pulmonary disorder (COPD) and a catheter that makes inserting an intravenous line easier each received $100,000 to move their ideas toward commercialization. Another six innovation teams received awards of $25,000 each in the Pitt Innovation Challenge (PInCh), coordinated by the Clinical and Translational Science Institute. The PInCh competition is designed to support creative solutions to challenging health problems. Supported by the National Institutes of Health, CTSI provides support to bridge the gap between innovative research and clinical practice. 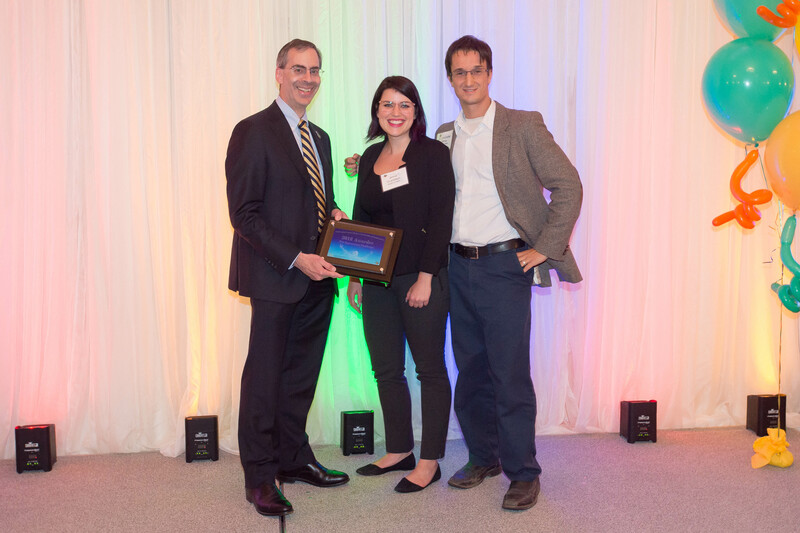 Two of this year’s $100,000 award winners also had projects from their labs receive funding in 2016, both of which have garnered additional research and commercialization funding, and resulting in a startup company, demonstrating the infectious enthusiasm for achieving impact through commercialization growing at Pitt. LungHealth-E, is from the lab of Cecilia Lo, Chair of the Department of Developmental Biology at the School of Medicine. Led by assistant professor Maliha Zahid, they are developing a small molecule that repairs the cilia in the lungs of people suffering from COPD. 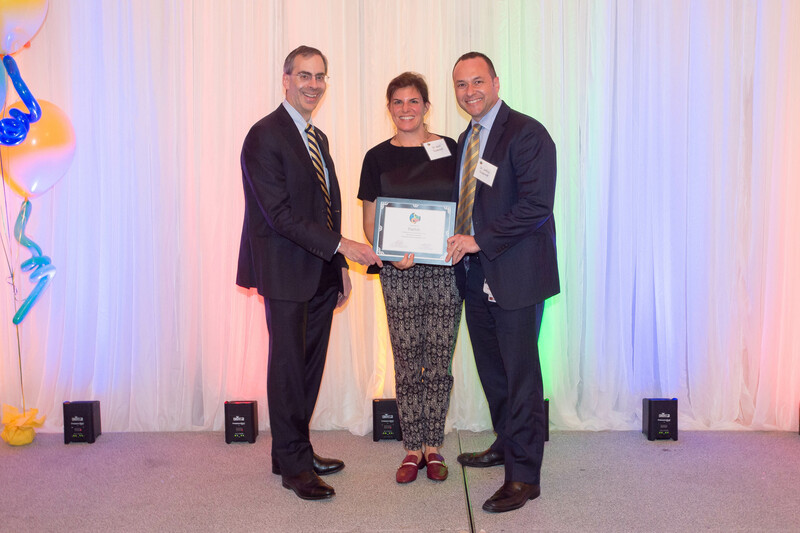 LungHealth-E also received a $25,000 bonus award sponsored by the sleep and respiratory division of Philips Healthcare. In 2016, Zahid led the Cardiac Targeting Peptide team that also won a $100,000 PInCh award. 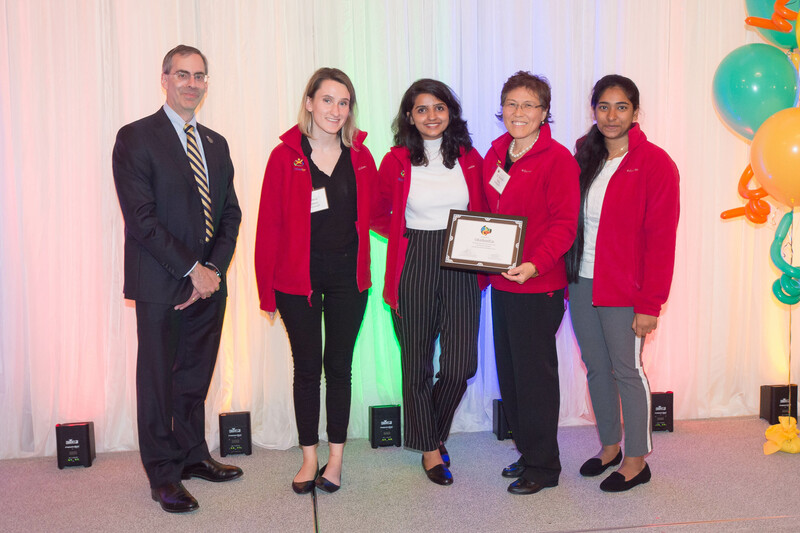 It also participated in the Coulter Translational Partners II program, which funds promising research resulting from collaborations between faculty from the School of Medicine and the Department of Bioengineering at the Swanson School of Engineering. Since then, the team has published four abstracts and has two grants pending. Zahid helped guide the project through two rounds of the Innovation Institute’s Pitt Ventures Gear commercialization program, which provides mentoring and funding from the National Science Foundations I-Corps program to conduct market research to test the commercial viability of research innovations. She is now participating in the national I-Corps program, which provides an additional $50,000. All told the team has received more than $250,000 in commercialization gap funding. “If the I-Corps exploration leads to a green light for commercialization, we will form a startup and apply for Small Business Innovative Research (SBIR) funding,” she said. The Health-E-Nose team is from the lab of Chris Wilmer, assistant professor in the Department of Chemical & Petroleum Engineering at the Swanson School. Led by graduate student Jenna Gustafson, they are building a cancer detection and health assessment platform employing gas sensors to detect disease biomarkers in human breath. “We’re excited and grateful for this award. The next step for our team is to develop the device architecture for a lung cancer detection sensor,” Wilmer said. In 2016, a student team from Wilmer’s lab won a $25,000 PInCh award. That team, Aeronics, launched as a startup earlier this year and released its first prodcut, Everyday Oxygen. The third $100,000 prize winner in this year’s competition is ThreadRite IV, led by Cameron Dezfulian, assistant professor in the Department of Critical Care Medicine and William Clark, Professor in the departments of Mechanical Engineering and Materials Science. The team has previously received $114,000 in gap funding from the Gear program, as well as the Center for Medical Innovation and Coulter and the Chancellor’s Innovation Commercialization Funds. “We are leased that previous PInCh awardees have used the competition’s funding to further validate their discoveries and are improving health by successfully translating their discoveries from the lab to the market,” said CTSI Director Steven Reis. Several of the $25,000 prize winners have also taken advantage of the education, funding and mentoring offered through Pitt’s expanding innovation and entrepreneurship ecosystem. Popsole, which is developing a shoe insole to relieve post-operative pain, has receiving CMI, Gear program and Chancellor’s funds. OK2StandUp has received Gear program funding and is currently a finalist in the Michael G. Wells Healthcare Competition. Both Popsole and OK2StandUp will participate in the University of Pittsburgh Innovation Showcase, from 5-7 p.m. on October 17 at Alumni Hall, Connolly Ballroom. More than two dozen Pitt innovations that are on the path to commercialization will be featured. Click here to register. See below the full list of PInCh awardees. Description: A cancer detection and health assessment platform that employs gas sensors to analyze human breath for the presence of disease biomarkers. Description: A novel method that uses a specific small molecule to target the root cause of chronic obstructive pulmonary disorder and helps patients breathe easier. Description: A modified standard IV catheter which measures electrical resistance and lets the care provider know instantly with a light, tone and vibration when the needle has entered a vessel. Description: A wearable device that detects muscle tremors in real-time using ultrasound sensors, and then provides muscle stimulation to alleviate the tremor. Description: An innovative approach to substantially improve the timeliness and dose selection of sedative analgesic medications for children in the pediatric intensive care unit. Description: A novel insole designed to reduce post-operative pain, maximize healing and encourage early ambulation and return to function. Description: A novel large vein IV wrap that uses a system of locking clips and snap tabs to secure a catheter and prevent it from pulling and sustaining damage. Description: A personalized alert system that prevents falls related to dizziness using a health monitor, mobile app and cloud-based predictive analytics software. Description: A novel ultrasound technique to inform rapid medical decisions in the clinic or on the field by instantly assessing location-specific tendon damage and weakening. 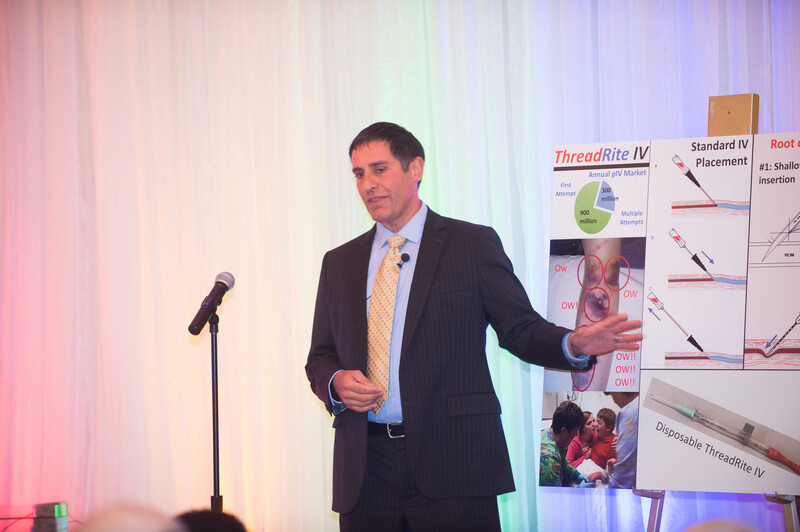 Cameron Dezfulian pitches the ThreadRite IV device to the judges. Cecilia Lo and the LungHeatlh-E team answer questions. Eunice Yang and the OK2StandUp team received a $25,000 award. The Popsole team of Beth and Jeff Gusenoff received a $25,000 award. The Health-E-Nose team of Jenna Gustafson and Chris Wilmer received a $100,000 award.